Whether you are looking for extra energy or more concentration and focus during your exams or working hours, this next supplement might really intrigue you. It goes by the name Neurogum and it is actually a potent energy booster in an unbeliveable form - chewing gum! It's absurd when you first read it... but once you get to know more information about this little bugger, you are bound to be amazed! Having a hard time studying for a test because you simply can’t focus on the task at hand? Are you a hard-worker but have reached a point where you just can’t make it through the day without feeling tired throughout half of it? If that’s the case, then you’re certainly trying to find something that will help you with these issues. Luckily for everyone, there are countless products on the market that are designed to do this. They come in all shapes and sizes (from liquids to capsules) and each of them has been created with a specific goal in mind: to give the user extra energy and enhance their cognitive powers. We’ve come upon a product that is perfect in almost every regard. Not only is it effective at giving you the much-needed energy boost, it’s also relatively cheap. The science that goes into this product is exceptional and has been tested throughout the years. The ingredients are simple, yet powerful when bunched up together into one product. This product is called ‘Neurogum’ and is sure to revolutionalize the methods of receiving extra energy and mental clarity. There are a couple of things you should know about these ingredients which will further cement your opinion on this product. Yep, it’s the same caffeine you find in coffee. One of the most beloved beverages in the world, coffee has already established itself as an ‘energy booster’, although some people have found that it doesn’t affect them. However, we’re not here to talk about coffee but caffeine. Caffeine doesn’t have a health risk (unless consumed in huge amounts) and has a couple of positives about it such as protection against Parkinson’s Disease, some types of cancer, and heart disease. L-Theanine is a naturally occurring constituent that can be found in green tea. It’s been used to treat anxiety and lower blood pressure (especially important for people who have high blood pressure constantly), but it’s also been found to be useful at preventing Alzheimer’s. Additionally, L-Theanine helps cancer drugs be more effective in treating people. Combined with Caffeine, these two ingredients make the bulk of this product; they provide the user with more energy, more mental clarity, and protection against various diseases. Oh, did I mention it reduces stress and ‘fixes’ your mood too? These two vitamins are vital for the proper functioning of our bodies. They are crucial parts when it comes to cell metabolism for a couple of reasons. Vitamin B6 supports red blood cell production as well as detoxifying your liver. However, it’s worth mentioning that without Vitamin B6, our bodies wouldn’t be able to synthesize GABA, Serotonin, and Dopamine which would have an adverse effect on your life. Vitamin B12 is a key player in keeping your brain healthy. DNA regulation and synthesis also require a steady amount of Vitamin B12 to work. If you don’t have enough Vitamin B12 in your body, you’ll be alerted to the fact by feeling slightly fatigued, depressed, and/or you could experience having weakened memory. Can these innovative chewing gums give you some nasty side effects? 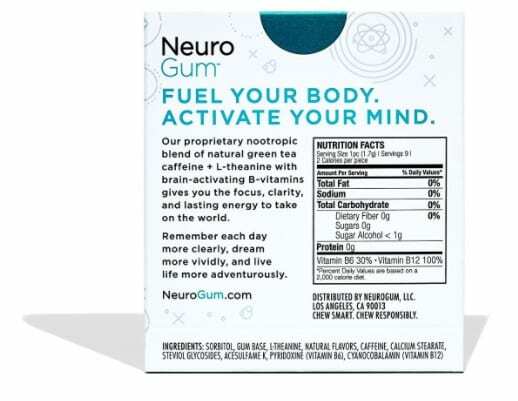 As far as Neurogum is concerned, you do not have to worry since there have been no reported side effects at least at the time of writing this Neurogum review. However, people who are not used to caffeine might experience some of its known side effects including headaches and raised blood pressure. Neurogum Reviews – Are they any good? If you’re still not sold on the idea of purchasing gum that gives you energy, helps you focus on your job/task, and lowers the stress you might be experiencing, just take a look at some of these customer reviews. These testimonials are from customers who have been getting Neurogum more than once. They are experienced with other, similar products and they’ve chosen Neurogum for a lot of reasons. Okay, so we’ve covered all of the ingredients. But is Neurogum worth your money and, if yes, why? In short, Neurogum’s ingredients do wonders together and that’s not all! Why are people saying that Neurogum is better than all the other products on the market, even if it comes in a smaller sample size and isn’t as packed with certain ingredients as other products are? This is where Neurogum’s creators come into the limelight and take the spot from everyone else. They realized that our bodies absorb things differently if taken differently. One practical example is medication. Depending on the severity of a person’s current health condition, different methods of giving them medication are used. If the person has a cold, he’ll drink tea and take antibiotics. However, if you end up in a hospital, they’ll most likely give you plenty of shots. How so? Well, intravenous injections are extremely quick. It may only take a couple of seconds for the drug to take effect. Drinking a capsule filled with medicine usually takes longer (due to digestion length and other factors such as body weight, height, age, etc.). And this is why Neurogum is so far in front of all other alternatives. Once you start chewing the gum, the ingredients will get released into your mouth through the process of buccal administration. This means that the ingredients from this product will get absorbed almost 5x faster than if you were to drink them. So in effect, you need much less product for the same effects that other products provide. What’s not to like! Neurogum’s creators took an ingenious path of creating a product that is simpler than others but works even better. Of course, we haven’t yet mentioned the price of this product and for good reason: It’s so cheap that we won’t mention it at all (but it’s around $20 for a medium pack, shh!). All in all, when you take everything into account, there really is no better product out there. Gum. Who would have thought? If your interest has peaked for this product, then we recommend you buy it directly on the Amazon website. The science side of this product is completely proven and approved. Multiple studies have been done on these specific ingredient combinations and it’s been found that they work exactly as advertised by this company. Provides an energy boost and protection against some diseases such as Parkinson’s. Also protects against several heart diseases and some forms of cancer. On its own – treats anxiety and controls blood pressure. Combined with caffeine – gives a pretty strong energy boost, helps clear your mind, deals with stress, and improves your mood. Necessary for proper cell function and regeneration. Enhances the liver’s detoxification process. At the time of writing this review, there weren't any notable side effects to write about. Neurogum is gum that has a plethora of benefits. You should opt for this product if you have high blood pressure, have trouble focusing and memorizing things, have a lack of energy, are too stressed out, etc. 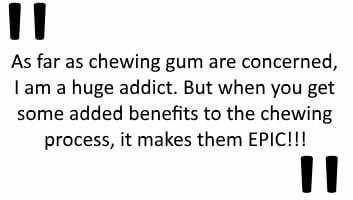 Just take some gum before choosing to do something (whether it’s studying, working, or exercising). Yes, but they aren’t as good as this. Of course, we aren’t saying that they don’t work, but they are expensive for what they offer (especially since there’s a product like Neurogum that costs less but is just as effective). So happy to see that this product is available on several online retailers! I’ve been looking for some alternative drinks and want to reduce my coffee and energy drink intake! CHARGED-AF Review - Should you stick to your preworkout or switch to this one? Xtend Go Review: What Makes This A Unique Energy Booster?